Belgium was left reeling on Tuesday after two attacks targeting the airport and a subway station in the capital killed at least 31 people and left nearly 200 wounded. In a message distributed via the news agency Amaq, the self-described Islamic State claimed responsibility for the attacks. Belgium was already on high alert after a key suspect in November’s Paris attacks was captured in Brussels last week, raising questions as to whether the city could have foreseen and prevented Tuesday’s tragedy. “We are determined to defend our freedom,” Belgian Prime Minister Charles Michel said, announcing three days of national mourning. People hold hands in solidarity near a memorial to victims of the attack. The Belgian prime minister announced three days of mourning. One of the first known victims to be identified was Adelma Tapia Ruiz, a Peruvian woman living in Brussels, according to Peru’s government. She was reportedly traveling to New York with her twin 3-year-old daughters when bombs exploded at Brussels Airport, according to The New York Times. The blast injured one of her daughters. A little past 8 a.m. local time Tuesday, several massive explosions rocked the crowded departure hall of Brussels Airport. Parts of the building’s ceiling collapsed after two suicide bombers detonated belts near check-in counters. Witnesses said many of the victims suffered injuries in their legs. The number of injuries is particularly high because the attackers used bombs filled with glass and nails. “I helped carry out five people dead, their legs destroyed,” airport worker Alphonse Youla told Reuters. Around 9 a.m., a third bomb tore through a subway car in Brussels’ Maalbeek station. The metro station is close to both the European Union headquarters and U.S. Embassy and trains were packed because of the morning commute. An injured man lies on the floor in Brussels Airport on Tuesday. The Islamic State militant group claimed responsibility for the attacks. At least nine Americans were injured in the airport attack. Among the injured are a U.S. Air Force officer, along with his wife and four children. Three Mormon missionaries from Utah were hurt as well, the church said. The mother of 20-year-old Joseph Empey told The Huffington Post that her son was wounded, but recovering. Another missionary, 19-year-old Mason Wells, is recovering from surgery after his Achilles tendon was ripped during the blast, family friend Lloyd Coleman told HuffPost. This was the third terrorist attack that Wells has been near. He was just a block away from the Boston Marathon bombing. And he was doing missionary work a couple of hours outside of Paris when that city was attacked. ISIS said in its statement that its fighters had opened fire in the airport before detonating suicide belts, while another suicide bomb attacked the subway station. However, Belgian officials don’t believe a suicide bomber was at work in the Maalbeek station, according to VRT news. According to the Associated Press, sources told an Iraqi official that the Islamic State had been planning attacks targeting airports and train stations in Europe for months. The official told the AP that militants moved their plans to Brussels after Paris attack suspect Salah Abdeslam was arrested. Amid a rapidly developing situation, Belgian officials confirmed on Tuesday that a Kalashnikov firearm was found near the body of a suicide bomber, but disputed that the victims in the airport were hit by gunfire. They confirmed that another bomb was later found in the airport. Authorities are looking to confirm the identities of three possible suspects caught on camera at the airport. In images released by police, the three unidentified men are pushing trollies with suitcases past the airport’s check-in area. One is wearing white while the two others are each wearing one black glove and black clothing. The attackers traveled to the airport by taxi with the bombs inside suitcases, Zaventem Mayor Francis Vermeiren said. Police are looking for one suspect in the attack on the airport. Agents conducted raids across the country on Tuesday, according to Belgium’s federal prosecutor. Tuesday’s attacks hit the heart of Europe, but Brussels’ vulnerability to terrorism came as no surprise. Brussels been on edge since radical Islamic militants killed 130 people in Paris in November. ISIS also claimed responsibility for that attack. Belgium — which has French-, Flemish- and German-speaking areas — has a notoriously dysfunctional government. 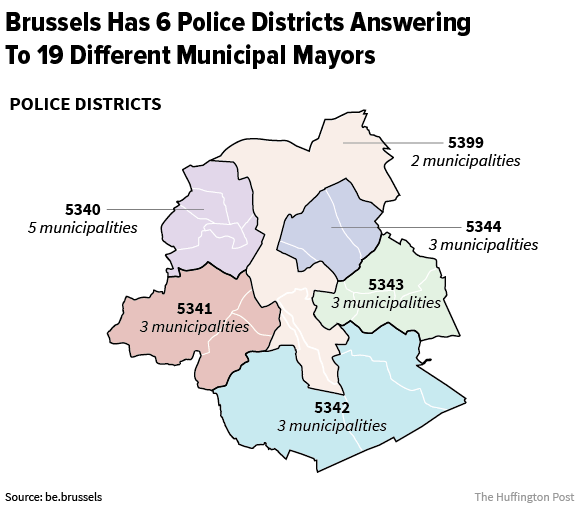 Brussels, for example, has six different police districts. Language barriers and political infighting abound in all levels of governance. These political divisions and institutional complexity also impede the ability of security services to handle complex counterterror operations. Several of the terrorists involved in the Paris attacks had lived in Belgium. The probe into the attacks revealed that even during the assaults, the terrorists had been in constant contact with a phone in the country, indicating that at least part of the planning had occurred there. Abdeslam, the most-wanted suspect in the Paris attacks, was known to have crossed back into Belgium mere hours after they took place. Worried he might detonate a suicide vest, Belgian authorities put the capital on lockdown at the time. The role of Belgians in the Paris carnage highlighted what was already known in security circles across the country — that Belgium is home to a significant number of Islamist extremists and that some of them are connected to militant cells across Europe. In particular, it turned the spotlight on Molenbeek, a neighborhood in Brussels that became known internationally as a hotbed of violent Islamic extremism after the Paris violence. French officials criticized Belgian counterterrorism for failing to detect the attack. “The Belgians just aren’t up to it,” a former French intelligence official told local press. Security experts also cautioned that the Paris attacks exposed gaps in coordination between different European security services. Mayor Francoise Schepmans of Molenbeek received a list with names and addresses of more than 80 suspected Islamic militants in her area — including two brothers involved in the Paris attacks — a full month before terrorists struck France’s capital. European police officials have long pointed to Belgium as “the weakest link in the chain,” Brian Levin, head of California State University’s Center for the Study of Hate and Extremism, told HuffPost. Belgian intelligence gathering “significantly lagged” behind other Western countries until recently, he said. The events in Paris also raised questions as to why previous assaults hadn’t lead to more forceful reactions from the security services. On May 24, 2014, French national Mehdi Nemouche opened fire in the Jewish museum, killing four people. In June 2015, Moroccon Ayoub El Khazzani boarded a Thalys train in Brussels and tried to open fire on passengers aboard. 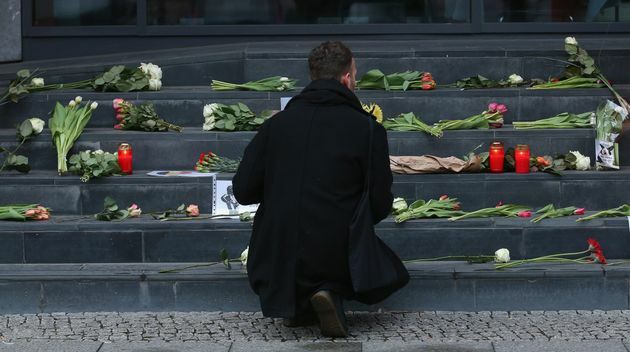 A man lays flowers at the steps of the Belgian Embassy in Berlin. World leaders reacted with shock and solidarity after the attacks. The tensions in Brussels heightened this week as forces closed in on, and finally captured, Abdeslam. Belgian police raided an apartment in the city’s Forest neighborhood last Tuesday, looking for clues on the Paris attack fugitives’ locations. They believed the apartment was empty, and were taken by surprise when inhabitants opened fire, wounding four officers. Mohamed Belkaid, a 35-year-old Algerian suspected of aiding the Paris attacks, was killed in the raid. Belgian officials said at least two suspects fled the scene. Police found weapons, ammunition and an ISIS flag at the scene, as well as the DNA of Abdeslam, who was previously thought to be in Syria. Abdeslam was finally captured on Friday, after a four-month manhunt. 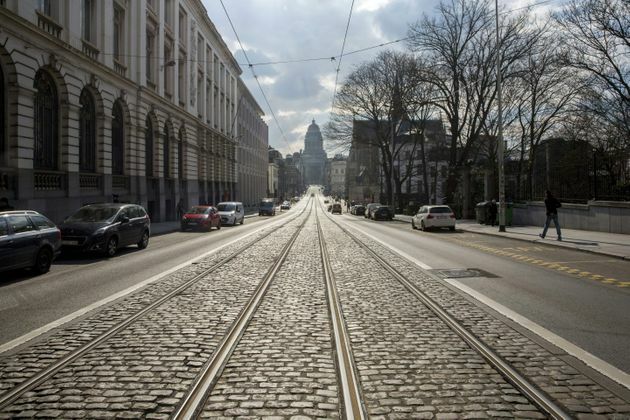 Police tracked his location using cell phone data and descended on an apartment in the Molenbeek neighborhood — just 300 meters from the home he grew up in. The 26-year-old Frenchman was charged with “participation in terrorist murder” the following day, as was Monir Ahmed Alaaj, another suspect captured in the raid who has used the alias Amine Choukri. Belgian Foreign Minister Didier Reynders said after Abdeslam’s capture that the militant had planned more attacks in Brussels, and that authorities were still hunting for further suspects. Belgium said Mohamed Abrini and Najim Laachraoui, Abdeslam’s associates, remain on the run. It’s too early to tell whether Abdeslam or any of the Paris suspects are connected with the perpetrators of Tuesday’s attack, Belgium’s federal prosecutor said. The attacks raise questions at why the Belgian security services were not better prepared for the attacks, after a week of heightened tensions. The attacks refocus attention on concerns about the Belgian security services’ ability to counteract terrorist threats. The challenge is particularly difficult — and urgent — in Belgium. Out of the tens of thousands of foreign fighters that have joined jihadist groups in the Middle East — many joining the Islamic State — Belgium is the European nation that exports the highest number of militants per capita. Belgium’s outsized number of foreign fighters dwarfs other Western countries. In total, experts estimate that up to 562 Belgians have at one point been foreign fighters in Syria and Iraq and over 80 have died there. The largest group of these fighters came from Brussels. Official government numbers are slightly lower, stating there have been up to 500 Belgian foreign fighters. The Muslim population in Belgian is a “much more cohesive, segregated and radicalized community” than Muslim populations in the U.S., Levin explained. This provides a network of both active and passive support for extremists like Abdeslam and allows them “to hide in plain sight,” he said. The Belgian government, as well as security analysts in the European Union and United Nations, have repeatedly expressed concerned about the potential threat that the country’s foreign fighters could pose. In October, a working group of experts at the U.N. urged Belgium to engage all sectors of its society in order to address the problem. Several former U.S. and European counterterrorism officials told NBC News that Tuesday’s attacks, coming so soon after Abdeslam’s captured, suggested a “shocking” level of unpreparedness by Belgian authorities. “What we feared has happened,” Michel, the prime minister, said Tuesday. Matt Ferner, Alana Horowitz Satlin, Nick Robins-Early, Sebastian Murdock and Willa Frej contributed reporting. For additional coverage in French, visit Le Huffington Post and their live blog; For coverage in German, visit HuffPost Germany; For coverage in Spanish, visit HuffPost Spain; For coverage in Arabic, visit HuffPost Arabi.